Beavers offers a diverse and dynamic programme of activities for boy and girls aged 6-8 years old. After attending the colony for a number of weeks, Beavers are invested. They make their promise to "Do my best to be kind and helpful and to love God". They are then given their distinctive necker for their group to wear with their distinctive turquoise jumper. Scouting offers friendship with a purpose: to support young people into becoming self-confident and vibrant individuals.By being part of a colony, District and County family, Scouting helps Beavers to begin to grow into happier, confident, young people, with a broad range of friends and a bank of happy memories. The Beaver programme supports young people in their first explorations of their community and their wider world. Skilled volunteers provide engaging opportunities for the Beavers to expand their knowledge, explore new horizons and develop interpersonal skills such as listening, team work and problem solving. Colonies meet weekly usually for an hour, and enjoy a mix of activities. From games and sports, to arts and crafts, there is genuinely something in the Beaver programme to meet every child's interests and aptitudes. Fundamental to scouting is a love of, and respect for, the great outdoors .Wherever possible, colonies will go out on visits to places as diverse as fire stations and forests. When your child joins a Beaver colony, they also become part of the worldwide family of scouts. This means they also gain access to an exciting District programme. Beavers from all of the colonies across Gateshead come together to compete in sports days, get creative and junk model,to laugh and have fun. Gateshead Beavers also have access to the wonderful events planned by Durham Scout County, including the Beaver Picnic at Moor House and the pantomime at Durham. The pinnacle of Beaver Scouting is the Chief Scout's Bronze Award. Beavers achieve this prestigious award by successfully completing six challenge badges which encourage them to learn new skills, try new skills and spend a night on a sleepover with their colony. Beavers who successfully meet the challenge are awarded their bronze award at an autumn ceremony presided over by the Lord Lieutenant of Durham at Durham town hall. Can you help transform lives? Volunteering with a Beaver colony is tremendous fun. The enthusiasm of the young people 6-8 years old means that adult support is rewarding and hugely valued. 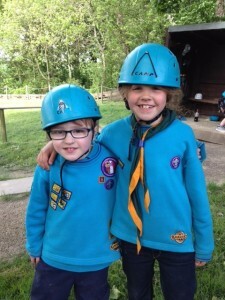 Beavers from Gateshead enjoy crate stacking at a county event.